Keeping it casual? Try this supersoft oversized tee. 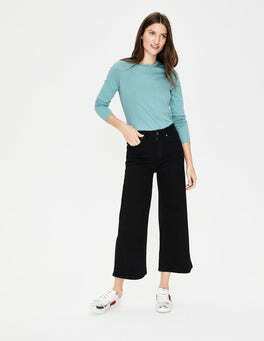 With slits on the hem and dropped shoulders in a cotton mix, this long-sleeved piece nails the laidback vibe for a busy day of running errands. To give it a little elegance, layer up with your favourite scarf and loose-fitting jacket. Never has 'supersoft' been so true and so fabulous. 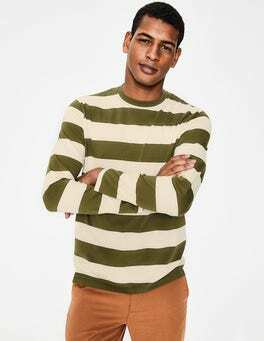 No capsule wardrobe is complete without a long sleeve T-shirt and this block-coloured crew neck is ideal for layering. Jazz up with a pencil skirt and Mary Janes for cocktails with the girls. This bright and bold sports top has hi-vis reflective branding down the sides, neon pink contrast neck-rib and stitching and is made with brushed moisture-wicking fabric, which will keep them warm and dry. Thumb holes in the cuff help keep out pesky chills too. Get set, be safe, go! …polo. Ours is made from lightweight, breathable cotton jersey with a subtle stripe knitted into the fabric and a textured slub finish. Functional buttons on the cuff and the sporty three-button collar mean it looks the part layered under a blazer in the office or as a smart alternative to a T-shirt. On an average day, you can find roughly 83% of Boden staffers wearing something stripy. Well, nothing beats a classic. 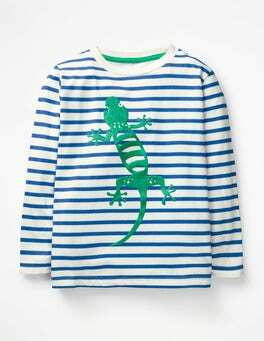 This long-sleeved Breton is made from supersoft cotton and is THE wardrobe must-have. Playful puff prints + pops of neon = this flashy T-shirt. It's also fully machine washable, so muddy puddles x active adventurers = no problems. 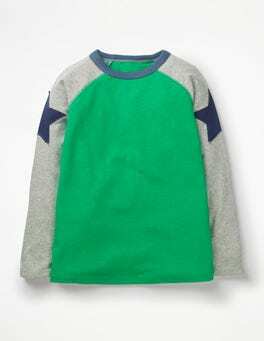 Long raglan sleeves and the pure cotton keep it comfortable, too. Colourful? Check. Warm? Check. Super convenient? Check. 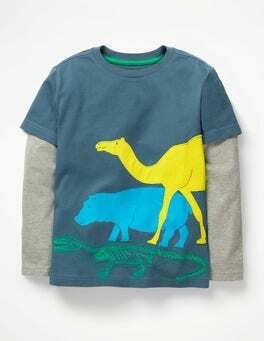 This T-shirt has doubled-up sleeves, so excitable animal lovers can head straight out on safari without an extra layer. Printed, appliquéd and embroidered designs mean they may not stay camouflaged in the bush for long though. Fun-filled festive days call for sequins. 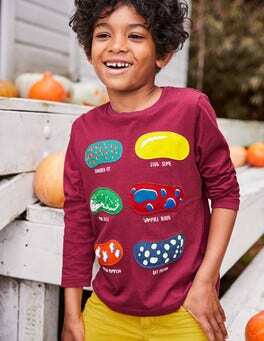 Made from 100% cotton, this long-sleeved T-shirt features a fun Christmassy graphic that's all about the sparkles, including metallic thread and glitter appliqué. Super shimmery, yes, but fully machine washable too. Ho, ho, ho indeed. Great British weather dampening moods? The pops of neon on this long-sleeved T-shirt will cheer things up. We've popped chugging buses or a good old drizzle of cats and dogs on the front – just right for rainy days watching telly. What happens when scary meets fun? 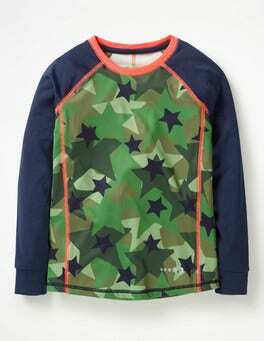 This long-sleeved T-shirt. In contrasting colours, it features amusing graphics, guaranteed to earn mischievous monsters extra treats. 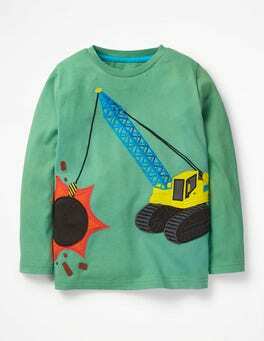 The cosy 100% cotton fabric is machine washable too, so it's all treats and no tricks. 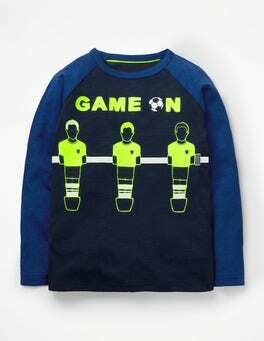 It's all fun and games with the bold neon design on our long-sleeved raglan T-shirt. The relaxed fit leaves plenty of room for tumbling and tearing around, while the cotton fabric will keep competitive spirits comfortable until the final whistle. This long-sleeved jersey top is all about The Three Rs. No, no, not reading, writing and arithmetic (phew). 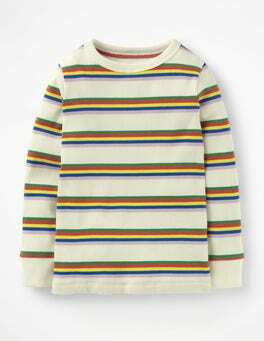 Instead, it's chock-full of rainbows, ribbing and really bold stripes. It looks especially picture-perfect layered under dungarees for a too-cool-for-school look. Anyone for an eyeball gumball? How about slug slime jelly beans? Look out for gloriously creepy motifs on our long-sleeved T-shirt. Pops of neon and colourful embroidery add extra gory impact to the appliqué design – no tricks needed. Micro ruffles. Deceptively simple but really effective. So here they are on the cuffs and placket of this pure silk blouse, which is our new take on the much-loved Ella blouse. With long sleeves and a semi-fitted shape, it showcases luxury style in a simple, yet elegant design. Our top quality T-shirts are the foundation of every man’s wardrobe. 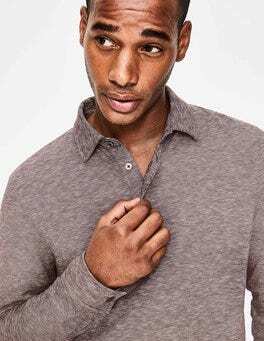 This best-selling basic comes in supersoft cotton jersey with a rib neck that’s great for layering. That tricky smart-casual dress code has met its match in this elegant, lightweight slub-cotton top. The broderie placket draws the eye, while the subtle gathers and long blouson sleeves flatter. Oh, and we added pompoms around the neck – just because. Soft, sporty and super easy to wear – our classic raglan top is a floordrobe essential. 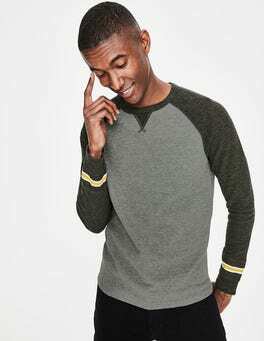 Long sleeves keep off the chill and the contrast piping add a pop of colour to layered looks (just add short-sleeved tees and hoodies). It's perfect for racing around the garden or playing in the park. The appliqué vehicles on this T-shirt is departing for adventure land. 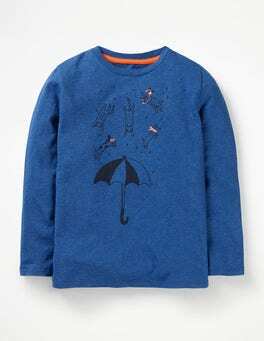 The long-sleeved design is tremendously toasty, just in case it's cold on arrival. 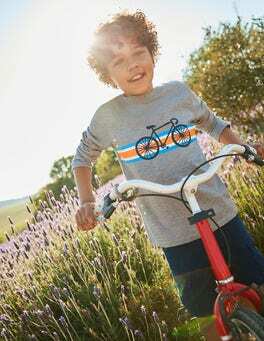 In 100% cotton this top is machine washable – so it'll be ready to go when it's time to get in the driving seat. Exercise in the great outdoors? Never fear with this cosy base layer. The thermal fabric wicks away sweat and the interior is lined with brushed fleece, keeping budding sports stars warm and dry. There's even reflective braiding for a bit of detail. 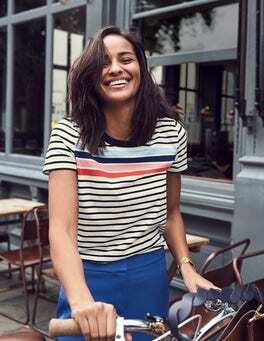 An eye-catching bike or plane print, bold neon stripes and a relaxed fit. What doesn't this T-shirt have? 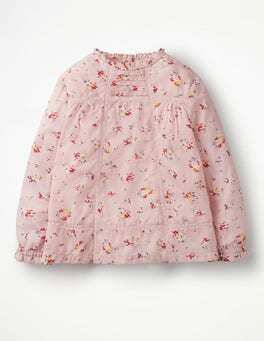 Its long sleeves and cosy cotton fabric mean it stays comfortable when zooming around at full speed. What's better than having a gecko on a T-shirt? Having a strokably smooth, furry gecko on a T-shirt. 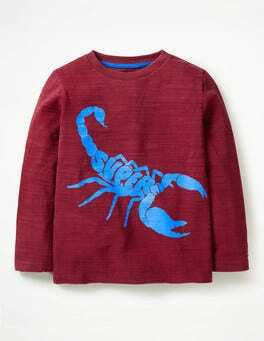 Pure cotton + long sleeves mean this top and its lovable creature are the perfect companions for cold-weather day trips to the local pond. 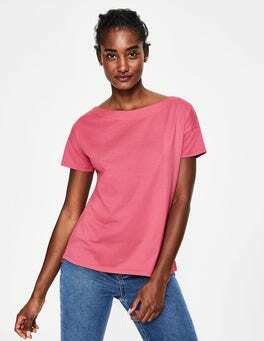 Touches of neon make this loud-and-proud emoji T-shirt pop and it's cut from 100% cotton with long sleeves for cosiness. No time for washing by hand? No problem. Grown-ups will be pleased to know both the navy bouclé option or print design can go straight into the washing machine. This T-shirt was made for adventurous spirits. Pops of neon and hints of glitter bring the animal graphics to life and the contrast binding on the neck and sleeve is as bold as it is colourful. It's just the thing to pack for that long-awaited summer holiday. 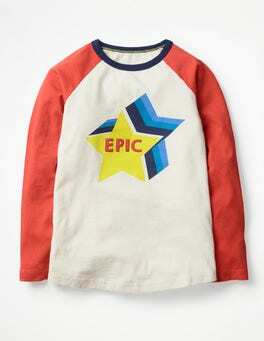 This appliqué T-shirt is made for Mini superstars. A contrast rib neck and long raglan sleeves keep it cosy during impromptu outdoor concerts. Matched up with the comfortable joggers, it’s ready for whatever the line-up looks like. When the temperature drops, you'll be happy to swap short sleeves for long ones – especially if you have this sporty top in your wardrobe. 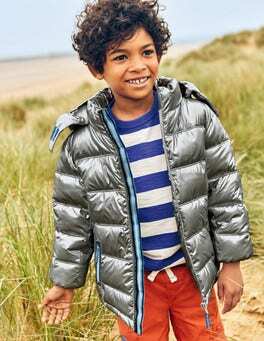 We've made it from thicker fabric for nippy days in the park, while the cool colourblock design is perfect for layering. 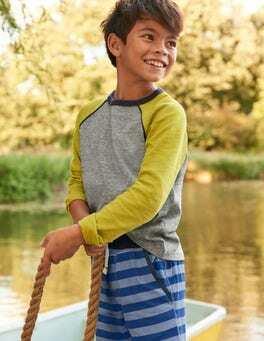 Keep little ones comfy in our 100% cotton body. These plain and pin spot options feature picot trim details around the sleeves, which are just the thing for layering underneath one of our pinnies. Poppers on the gusset and back make for quick changes on busy mornings. …ones comfy in our SUPIMA® cotton bodies. These feature embroidered strawberries, ivory broderie or daisies on the collar and a picot trim around the sleeves, which are just the thing for layering underneath one of our pinnies. Poppers on the gusset and back make for quick changes on busy mornings. What’s the one thing better than your favourite relaxed top? A supersoft relaxed top. 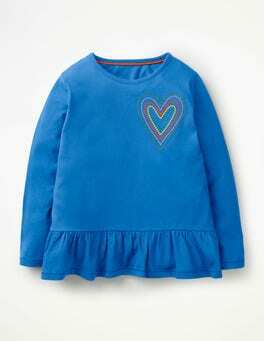 This design is made from soft modal cotton. Short sleeves, a wide neck and dropped shoulders create a relaxed feel that’s just the ticket for long brunches or weekend shopping trips. Made from pure lightweight linen to keep you cool, this top is holiday-outfitting perfection. It has a V-neck for a flattering look and ideal for showing off a delicate necklace. This style is longing to be paired with skinny jeans or shorts and taken for a stroll on the French Riviera. These five long-sleeved bodies come in three transport prints as well as two stripes. An envelope neck opening and poppers make changes a breeze, while a handy drawstring bag keeps everything together.